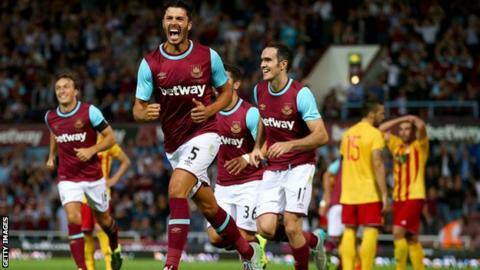 James Tomkins scored a 90th-minute winner to earn West Ham United a narrow Europa League second qualifying round first leg lead over Malta's Birkirkara. The Hammers dominated possession but failed to make it count until defender Tomkins chested home from a corner. In front of a crowd of 33,048, Modibo Maiga hit a post for the hosts, while skipper Kevin Nolan went close with an acrobatic volley. Birkirkara went closest through Liliu, the return leg taking place on 23 July. "West Ham have won a game which looked like being 0-0 by nicking a goal at the end. It will be a different game away from home. Birkirkara played like it was a cup final for them. Can they work that hard again? If West Ham had won 5-0 Slaven Bilic could have left his key men at home next week but now they will all have to go to Malta." Hammers boss Slaven Bilic's side will have to perform better in Malta if they are to make sure of a place in the third qualifying round. They made heavy weather of seeing off a team 318th in Uefa's club rankings - 200 places below West Ham. Bilic made seven changes to the side that won against Lusitanos in Andorra last week, with experienced first-team players Nolan, Aaron Creswell and Winston Reid all returning. But they lacked cutting edge and when one second-half move resulted in the ball being played back to goalkeeper Adrian, some sections of West Ham's support booed in frustration. Mali forward Maiga could have had a hat-trick, the 27-year-old going closest when goalkeeper Justin Haber palmed his 27th-minute effort onto a post. Maltese Cup winners Birkirkara defended in numbers and were minutes away from a memorable result when Tomkins struck. Mauro Zarate's corner was missed by Haber, allowing Tomkins to chest over the line for his second goal in Europa League appearances this season.